Supple, compact hollow ﬁbre ﬁll for superior warmth and ultra lightweight. 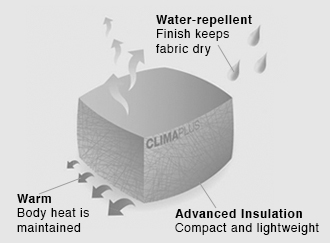 This advanced insulating layer has all the suppleness and warmth of down, but in a compact, quick-drying 100% synthetic form whilst being ultra lightweight. It can be packed or stuffed without losing its loft and the water-repellent face makes it a superior weather-beating outer for cold climates.